Introduction: Operation Blue, the german offensive designed to take Stalingrad and the Caucasus, began on 28 june 1942. Initial progress was encouraging, and Army Group B completed the first phase of its operations at Rostov on 23 July. Once it crossed the Chir river in an attempt to make a quick breaktrough, however, Army Group B was confronted by the main forces of the Stalingrad front. In this map, the first thing one can see in a first view is that the germans have the better defensive positions. The Chir river decreases the mobility of any Russian offensive against the german key city. This is specialy true in the points designed as A and B (see above). This points will be the ones the Russian will most likely use to launch any atack, because in this scenario, it has only towed and wheeled Artillery and AA, so trying any flanking maneouver, using Arillery and AA moving across the river heading point C, to then launch an offensive in open terrain, would mean to the russian player a lot of turns that can ill aford, since this maneouver would leave all the river acceses open to german infiltration and with little oposition to run for the russian key city. 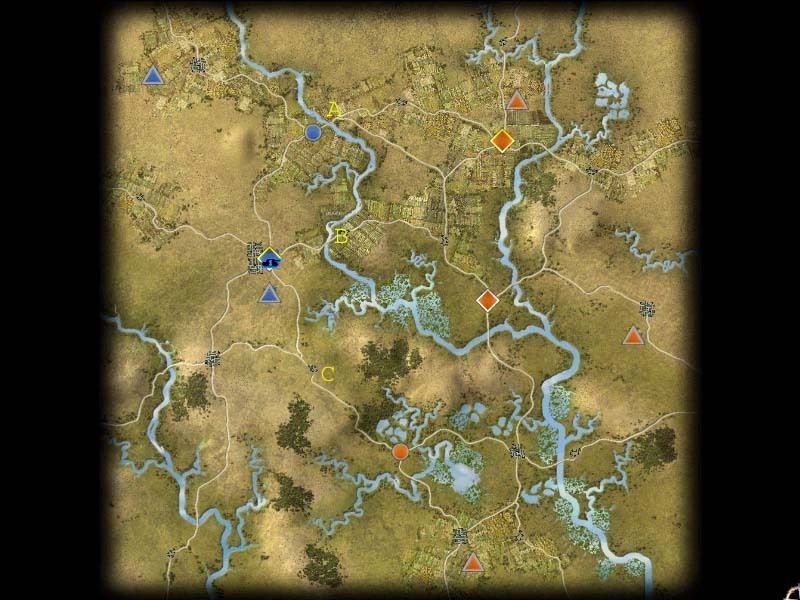 Of course, if the players manage to play in normal way (letting the players build and deploy the army at will), then it would be a good option for the russian player, placing one part of it´s army in the deployment hexes near point C and try to launch an all out atack by the open terrain. I will make my strategic considerations based in the players using Alternative way (AI builds and deploy initial army). In Altenative way is very unlikely that the AI deploys anything in hexes close to point C. For the german player is easier to mount any offensive, since it is deployed very close to the river crossing and there is only open terrain ahead. I must say now that i will not recomend any strategy to use in this map, since you can use a lot of them. In this article i will only make strategical considerations. The strongest point of the Russian army in this scenario is their medium and heavy tanks. German tanks are no match for them. But on the other hand, it doesn´t matter how powerfull russian tanks are if you let the geman player supress and bomb them freely with its bombers. Since tanks are the russian army strongest point for this scenario, then you must give them an adecuate air cover, and this must be the russian General first concern before any other planning. In the German side i must mention 4 very important units for this scenario. The first one in importance is it´s Ju87G bomber. This bomber is a tank buster with 13 points of Hard Atack that can make up to 4 atack raids over an enemy tank. So this is one of the german key units against the russian strongest point in the scenario. The second in importance is the 88MM Flak. This AA can move over the terrain freely since it is halftracked and give Air cover to the german army anywhere. It also has an Air Atack of 15 points and 3 hexes of range. Since you have weak tanks and will rely a lot from your artillery to supress russian tanks, any damage you can avoid from russian bombers is vital. The third unit in importance is the K18 Artillery. If you can manage to get one, then you will be able to supress or destroy vital units covering the Red army as artillery and AA, from a very long range (5 hexes). The fourth unit in importance is the Fallshirmjager infantry unit. With this unit deployed in the airfiled close to the city of Kerensk, you will be able to give your army a fast response infantry support in any atack route you choose, since its action radious goes a little hexes beyond the russian key city (Bugaev). Well, i hope many of you find the tips in this article of any use for upcoming battles across the Chir.